Nissan Middle East has launched its fully redesigned commercial vehicle NV350 Urvan, featuring the best-in-class fuel efficiency for gasoline and diesel engine models and a larger cargo space. The vehicle, unveiled the presence of Hideto Murakami, corporate vice president, Nissan Motor Company, also offers lower running costs, and enhanced driver and passenger convenience, a statement said. “Nissan’s expertise in commercial vehicles spans more than eight decades and today boasts one of the widest range of LCVs (light commercial vehicles) in the world serving a diverse customer base with the broadest possible breadth of requirements,” said Murakami. Atsuo Kosaka, managing director, Nissan Middle East said: “Nissan NV350 Urvan’s combination of low running costs, durability and flexibility have been helping large and small Middle Eastern businesses deliver on time and on budget for four generations. 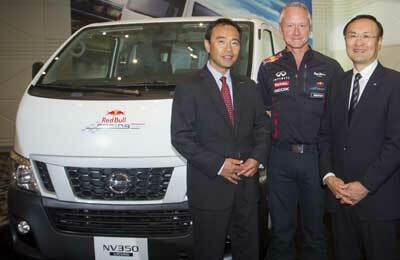 At the occasion of this event, the cooperation between Red Bull Racing and Nissan was presented. Read Bull Racing, which is based in Milton Keynes in the UK, is making use of Nissan light commercial vehicles. To assist with Red Bull’s transportation needs, Nissan’s Light Commercial Vehicle Business Unit is supplying a fleet of more than 30 vehicles and related services to the team. Nissan support vehicles have been based at the team’s UK headquarters and used for all European events.